My 5-year-old daughter Sophia is horse crazy (just like I used to be), she dreams of owning her own pony someday and loves to play with toy horse and ponies and have riding lessons. So she often watches Spirit Riding Free on Netflix, a TV show about a young girl called Lucky and her horse Spirit. 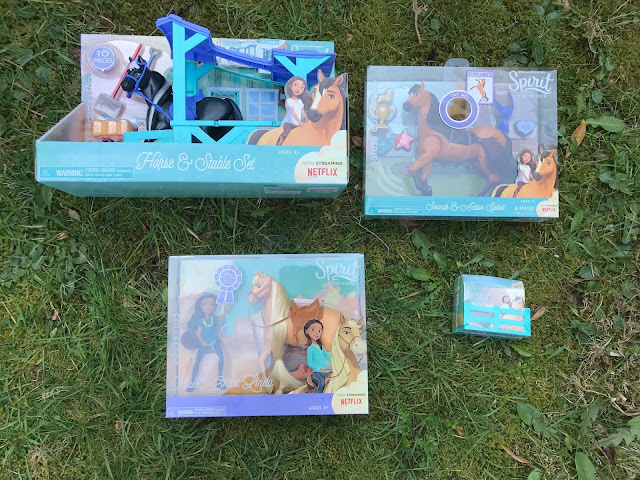 So when I found out that there was a range of Spirit Riding Free toys by Flair I knew these would be a big hit with fans of the show. We were sent some of the toys to review, so read on to see what we thought. 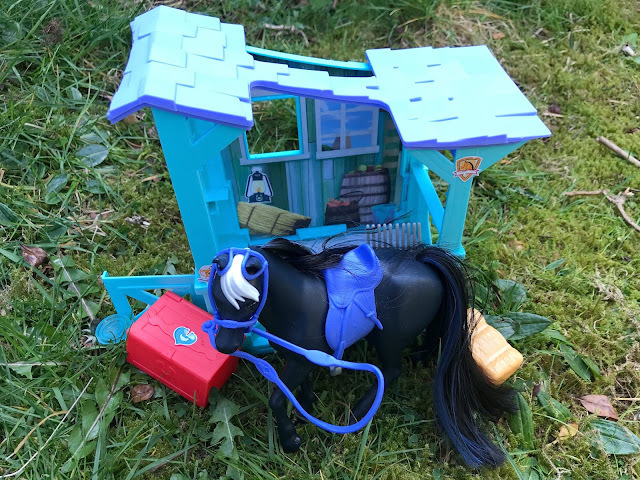 This was Sophia's favourite as it is a stable, horse and lots of accessories. 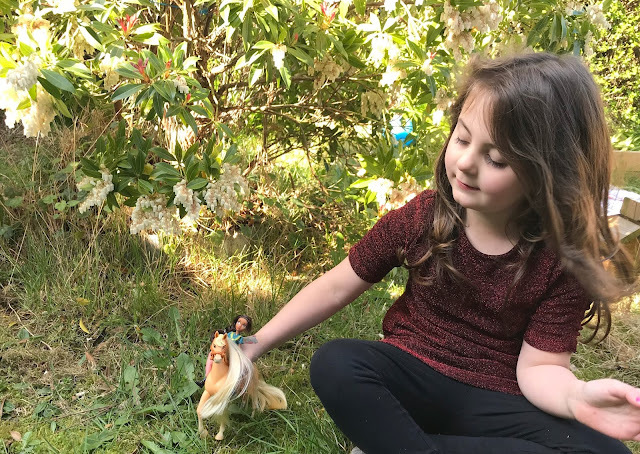 The set comes with a 7'' horse inspired by the show, it has a lovely soft mane and tail that children groom as it comes with grooming brushes. The stable fits the horse and has a handle on top for ease of play and the side opens to create a playset. It comes with accessories, such as hay bale, mucking out rakes and spade, tack, grooming brush, tack box and stickers. 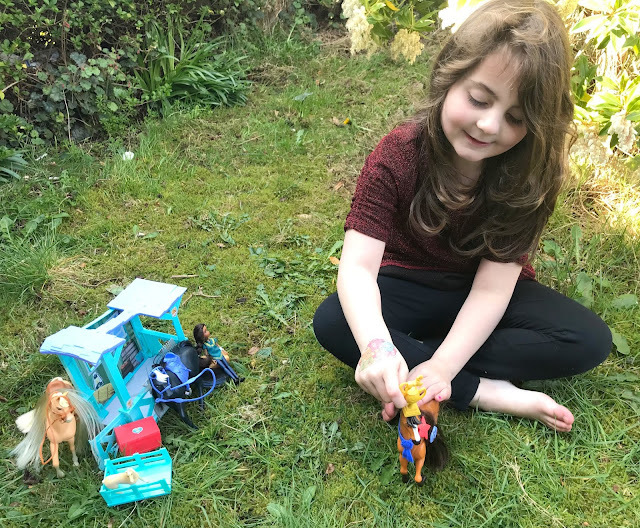 Sophia has had lots of fun playing with this set, pretending to look after the horse and it is great to use with the other sets. There are a few different horse and dolls to collect from the show we were sent Prudence and Chica Linda. The doll has fully poseable arms and legs, perfect for riding and taking care of the horses. I liked how this set came with the horse and rider as it a great little playset to encourage imaginative play. You can also get Lucky and Spirit and Abigail and Boomerang. We were sent Spirit horse and he came with a grooming brush, trophy and rosettes. He has a button on his back which when pushed makes him stamp his front leg, you can also move him so he rears on his hind legs. He makes realistic horse sounds and if you pet his muzzle he will respond with noise. These are small blind bag type toys, it is a box shaped like a stable that contains a small horse figure. You don't know which horse you have until you open your box, we were sent two sets and we ended up with two of the same horses, Chica Linda. The box turns into a little stable for the horse to stay in. Sophia really likes these toys, she has played with them a lot over the past few days making up games. She really likes all of the sets, although the stable set is her favourite due to all the accessories it came with. As a parent, I like that these toys represent the tv show and are not too expensive and that all of the pieces can work on their own or together. 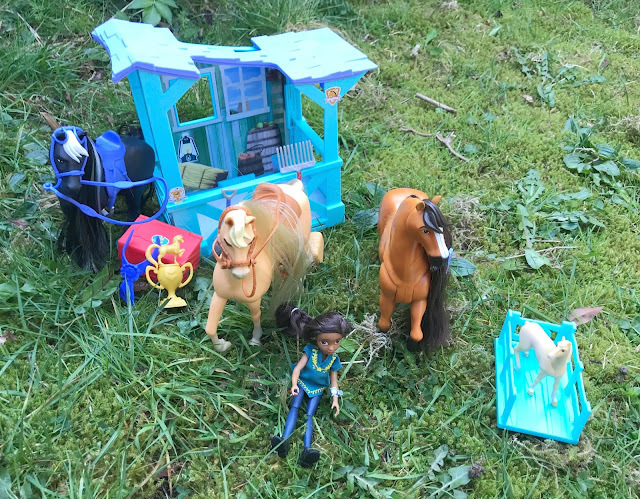 If you have a fan of the show or even if you just have a child who likes horses then I am sure they will enjoy these toys. You can buy the Spirit Riding Free toys now from Smyths and Amazon. My girls love spirit! They've been lucky to receive a few spirit toys and they are well loved and played with. Your Daughter looks very content testing the new spirit toys. I was surprised that the prices are so reasonable as I know this particular show is very popular at the moment! This toy collection looks great. I love that they look so realistic and there is a good mix of product options. Alessia loves this series on Netflix and would love this set! These look so much fun and what a great range of toys. These will make a great gift for my friends daughter who is horse mad! !